It is feasible implementing similar accuracy level of synchronization that provides a GPS receiver, in a device connected to an Ethernet network. The technology required to benefit from this innovation is based on Precise Time Protocol (PTP). PTP is defined in the IEEE 1588-2008 and IEC 61588:2009 standards. 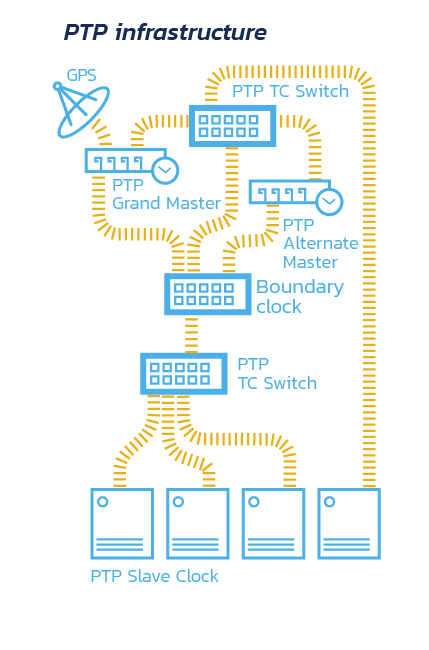 PTP protocol is able to synchronize networked clocks with accuracy down to the nanosecond range. It is based on the Packet Locked Loop (PLL) approach. Like any active synchronized circuit, the IEEE 1588 clock is a servo implemented with a closed-loop algorithm. The final aim of these calculations is providing an accurate 64 bit timer in all the synchronized devices. This timer can be used for Data timestamping and for distributed control and even for Operating System synchronization purposes.